Turf Landscape With Your Wine? Don’t mind if we do!! 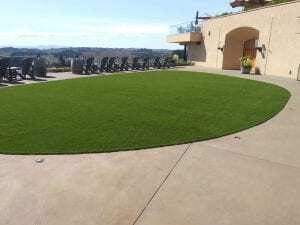 Cascade Greens had the pleasure of installing a nice size area of artificial turf landscape grass to a hard to reach area at Willamette Valley Vineyard. Sometimes, its the hard to reach areas or hard to grow grass areas that can really make the difference in a landscape. 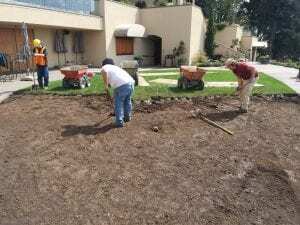 The first step to preparing the ground for installation is excavation. Our crew had a hard days work of excavating by hand due to the access to the install area. This includes good ol’ manual labor with shovels and wheelborrows. Luckily, we have motorized wheelbarrows called Muck Trucks that help with the hard work! Then, after the grass and a few inches of dirt have been removed, is landscape fabric and gravel. 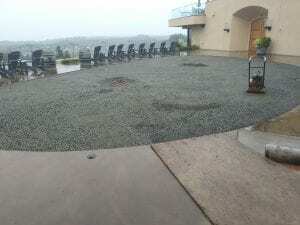 3-4 inches of open gravel is needed for drainage and an even surface for the artificial turf landscape grass. If there are any drainage concerns or issue, this is the time to address them. When we have the dirt exposed and prepared to lay gravel, we have a few options of how to make the heavy rain water flow better if needed. Drainage piping can be added or sometimes just an extra few inches of gravel can solve the problem. For this job, the gravel will take care of all the drainage needed during our heavy rain season. After gravel is in and compacted, the turf is laid down, seamed and cut to the correct size. Putting greens or landscape, all of our turf is nailed down around the edges and seams to avoid any disruption of the edges. With the turf seamed and cut, the last step is to infill the turf landscape grass with sand. This part of the job is a little monotonous but very important. The amount of sand infilled will help determined how the blades of the turf stand up. The amount can different slightly depending on the specific type of turf due to height of the turf blades. Our crews are all trained and have many years of experience to know what the right amount is. As the turf is being infilled, grooming with a power broom is helping the blades stand up and the sand fall down in-between. The last step of the installation is owner approval. We pride ourselves in customer service and our goal is to leave every customer satisfied at the end of a job. Call anytime for a free consultation and estimate. Article "The 411 on Artificial Turf"